If you want to learn the sales techniques that really work, this audio book (in either CD & MP3 format) is for you! Imagine having the power of hypnosis - coupled with Neuro Linguistic Programming behind you - as you work. You can achieve amazing results after listening to this easy-to-understand guide to Sales Mastery! Hypnosis is a skill that takes training and development. Clinical hypnotherapists are board certified and maintain ongoing educational and clinical training. Many hypnotherapists begin with undergraduate studies in psychology, human behavior, and communications. These are good foundations for the specific techniques and training used in hypnosis. They can also be a good background for a great sales person. Neuro Linguistic Programming (NPL) and other hypnotic techniques can be self-taught through the right kinds of tools and training. It then lays the foundation for further development of hypnotic skills that can be used to help your self and others overcome fears, change life long habits, develop better skills, and handle difficult situations. 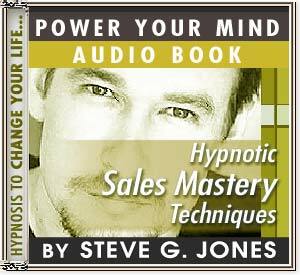 One such skill attained through hypnosis is mastering the art of the sale. We’ve all seen the type of person that gets labeled a natural salesman. This person knows what to say, how to say it and when to let the other person make their decision of whether or not buy into what they are selling – be it a product or an idea. Those skills are sometimes natural, but often fine tuned and perfected through education and training. That "innate" ability can become anyone’s through hypnosis. Dr. Steve G. Jones M.Ed., Board Certified Hypnotherapist, has developed an audio book program that can teach you the ins and outs of NPL and basic hypnotic techniques. His audio book, Hypnotic Sales Mastery Techniques focuses on the kind of linguistic programming that makes a great sales person. Knowing how others think and respond to sales messages is the key to successful sales.